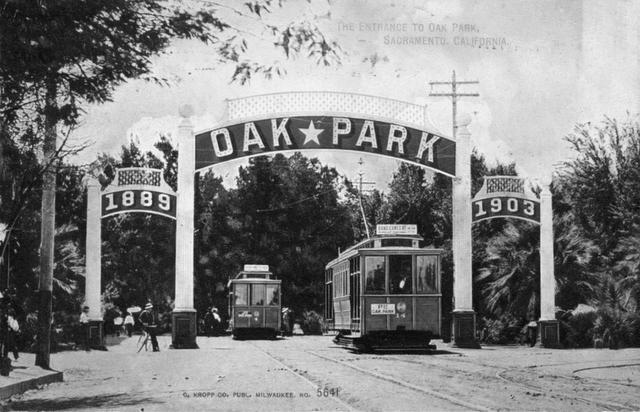 Th original entrance to Oak Park in 1903. SACRAMENTO – Vice Mayor Jay Schenirer invites you to the groundbreaking ceremony for the McClatchy Park Renovations. Saturday, April 26, 11 a.m. to 1 p.m. The day will include a groundbreaking ceremony for the park improvements, which will include a new playground, a carousel inspired water play area, new tennis courts, skate park, jogging trail, basketball courts and more. McClatchy Park is located on the site of what was “Joyland”, a turn of the century amusement park that included a zoo, carousel, miniature train and a wooden roller coaster. The new playground will include a “Scenic Railway” inspired play structure flanked by ice cream cones, popcorn and candied apple climbing features. Other features include a fun house structure and a replica of the original miniature train and climbable zoo animals. The event will also kick-off a week-long “Eat Local Challenge” for the Oak Park Farmers Market, which will lead up to the season opening on Saturday, May 3. Participants will receive a free “Eat Local Challenge” toolkit with a calendar of activities, information on local restaurants that source produce locally, and seasonal recipes. The event will also include food demonstrations, samples from local farmers, free yoga, live music, a jump house and more. The Oak Park Farmers Market opens for the season on Saturday, May 3 and will run each Saturday morning through October with weekly yoga, chef demonstrations, live music and delicious local produce.